You are here: Home / Blog / General / On-site bathtub enamelling – what it is not? Dear Readers, here’s another technical text that I hope will put some light to different aspects and confusion about enamelling services and on-site resurfacing. When it’s about any bath or shower tray restoration I often get asked the same set of questions. Answering some of it here, would hopefully help to understand why there is so much of crossed information about my trade. Is it (vitreous) enamel that you use? It is not. As answered in my FAQ, the original surface of your cast-iron or pressed steel bathtub was created using a very high temperature. The vitreous enamel requires above 750 Celsius degrees to be applied properly onto a metal surface. Look at the stove bathtub enamelling video at the bottom of the article, please. Not doable in domestic conditions, and none of the on-site specialists uses vitreous enamel for restoring (resurfacing) your bathroom suite. To what is used most often in-situ repairs, are special products for spray application that is close to the marine and automotive industry but adapted to use for this specific service. I mean high quality dedicated tub resurfacing coatings and undercoats (no DIY). Refinishing industry is doing better each year and so the product choice and quality you can get is like never before. I will review the products I’m using in one of the next articles, it is the company that does support refinishers for over 30 years. This special system of undercoats and finishing coatings is giving a durable, both scratch and chemically resistant surface. There is a wide range of suppliers and products these days but the most important in my opinion is a human factor. A good preparation, understanding of procedure and products that work to the situation is vital. 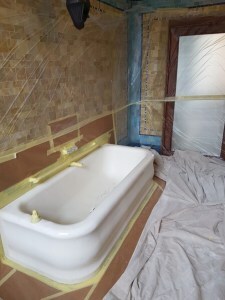 To completely restore a bathtub to a satisfactory level, it often takes me over 6 hours. I have heard about companies that doing a few jobs per day and only need less than a half of that time. Whether it is – taking shortcuts on masking or preparation of the surface? Sooner or later it comes back as a poor quality product and cast a shadow onto a full trade. 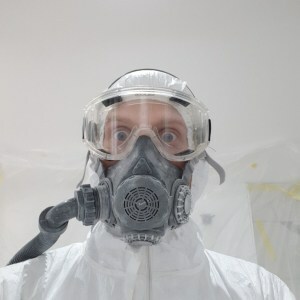 bath resurfacing in progress – deep cleaning and deglossing the enamel surface. 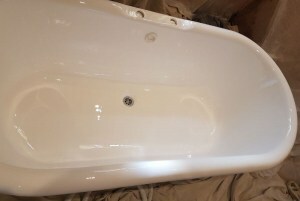 one of my results – Salisbury bath repairs. Beautiful deep wet gloss finish (click picture for more quality examples). As above, there are more suppliers of refinishing products these days and each system has its advantage. I use one of the worldwide leading systems, high-performance coatings for refinishers. Key factors that I thrust it are the durability (both for adhesion and impact) and a showroom quality topcoat finish. It also has a few unique technical advantages that I could not find with any other system and compliment my professional level as an applicator. It’s also worth to mention that the products that I can use now, has not been available like 20 years ago or more. The science around my trade is constantly evolving. this involves the masking and preparation (both site as the target surface), health and safety, application and all the details of your scheduled plan of action. 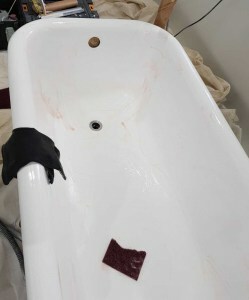 I use a different process and part of the materials for cast iron bath restoration but completely different preparation is needed for acrylic baths repair. For example, you don’t chemically etch the plastic bath tubs, while deglossing the porcelain or enamel substrate is desired. Quality in each step, the only recipe for a succesful result. Entire room is protected from overspray and damage. Don’t forget to look awesome! Something that varies the results in quality so much in between is a professionalism of a person that does it. I could write another post about how great my methods are but just look at the galleries – all in there. Not only before/after picture but the detailed gallery of me showing the quality of each step I do. I take pride in what I have to offer, over the years I developed a system that is a bit unique in some aspects. True is – I had the ability to gain from much better technicians than myself. My methods are best – best for me. I try not only to copy others but check, question and challenge myself as long as I’m interested to get better in what I do. Experience is not built thru a year, neither the good quality does come from the materials and equipment only. 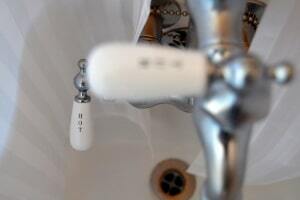 It needs organisation, experience, knowledge and precision – so let me be your bath doctor!